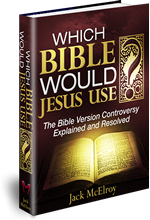 Video - Which Bible Would Jesus Use? - Which Bible Would Jesus Use? Prove to anyone why the Lord himself is forced to choose only one Bible and why that Bible is the King James Bible. Why the Lord Jesus Christ would never use the ESV because of the known errors (admitted by experts) inserted into the text in Matthew Chapter 1. Why the Lord wouldn’t carry the NASB to church with him because of the known errors (admitted by experts) inserted into the text in John Chapter 7 and because of the way it refers to him in John 1:18. Why the Lord couldn’t use the NIV, ESV, or the NASB because of the known geography error (admitted by experts) inserted into the text in Luke Chapter 4. Why the Lord can’t use the NIV, ESV, or the NASB because of the known error (admitted by experts) inserted into the text in Mark Chapter 1. Why the Lord is hurt by how his character is besmirched in Mark Chapter 1 in the NIV and would never, ever use it. Why the Lord wouldn’t bring the NKJV into church with him because of how it undermines the historical integrity of his words in English. Contains new thoughts, information and explanations found nowhere else; Includes bibliography, index, Scripture index, Over 60 pictures, 56 charts and 278 footnotes.